Created by first-year student Evie Cheung, Peachee is a product/app combination that is on a mission to better your living environment by creating a social roommate experience and system for rewarding good behavior. Using a physical treat-dispensing device, attractive mobile app, and in-app integration of political action, Peachee will help keep your apartment (and the world) peachy keen. While there are countless roommate and task management apps, few harness the power of smart home technology and Internet of Things. Currently, the world is experiencing unprecedented urbanization, causing many young people to cohabitate in dense urban centers. This increases risk for in-apartment conflicts and stressful living environments, in addition to the already turbulent larger political environment of the world today. To address these conflicts, Peachee encourages direct communication, accountability, and political action by using fun and delight. While there are countless roommate and task management apps, few harness the power of smart home technology and Internet of Things. Peachee combines the convenience and ubiquity of a mobile app with a fun three-dimensional product that can sit in any common area of a typical urban apartment. The foundations of Peachee are simple; the system is built on the psychological learning theory of operant conditioning, which states that learned behavior is a direct result of consequences (positive or negative). Good roommate behavior or political action is rewarded with positive reinforcement in the form of cookies and praise. Good roommate behavior or political action is rewarded with positive reinforcement in the form of cookies and praise. It all started with some inspiration from Evie’s roommate and 100 sketches, which helped her explore potential products and use case scenarios. From there, a user journey was mapped out with a storyboard. 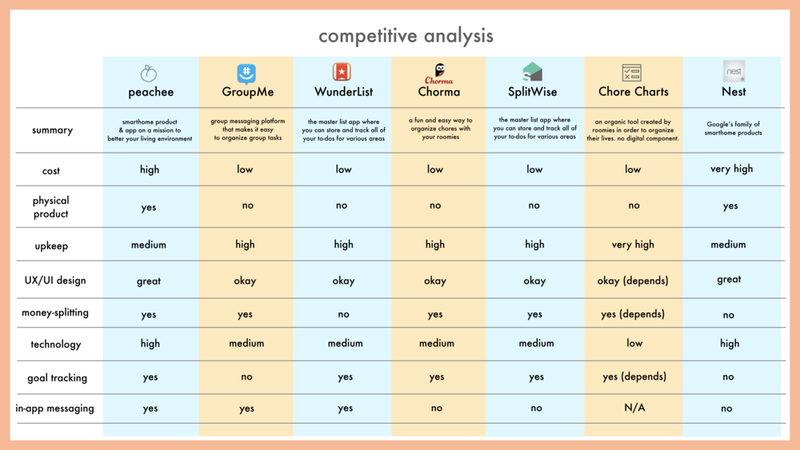 A comprehensive competitive analysis was conducted to learn more about other smarthome technology and roommate and task management apps already available on the market. Next came the creation of two mobile apps: one good, one evil. The good app illuminated the user flow within the Peachee app and interaction between roommates. The evil app, Crave, flipped Peachee’s main methodology on its head; instead of rewarding good behavior, Crave rewarded bad behavior. The main objective here was to fuel addiction; it even had a slot machine built into the app. Peachee was then brought into the real world with three different campaigns. The first was a tampon box subscription service that was an add-on to a Peachee subscription. The second was a dark political campaign. And third was a food and drink campaign designed to encourage interaction with your neighbor. Given Evie’s background in psychology and social responsibility, it was difficult for her to create a product that only had an impact in a single apartment. "It was time to integrate the larger world into this." Given Evie’s background in psychology and social responsibility, it was difficult for her to create a product that only had an impact in a single apartment. "It was time to integrate the larger world into this," she offers. After revisiting her dark political campaign, Evie found research that conveyed negative news has a detrimental impact on mental health. From there, Evie explored ways to integrate political action into the existing Peachee app and product. Instead of a stressful approach to politics, Peachee’s seamless integration of calling your government representative makes it easy to take political action. The user can simply choose their issue and the app will choose the correct representative to call. If the user is wondering what to say, the app will even give them a script. 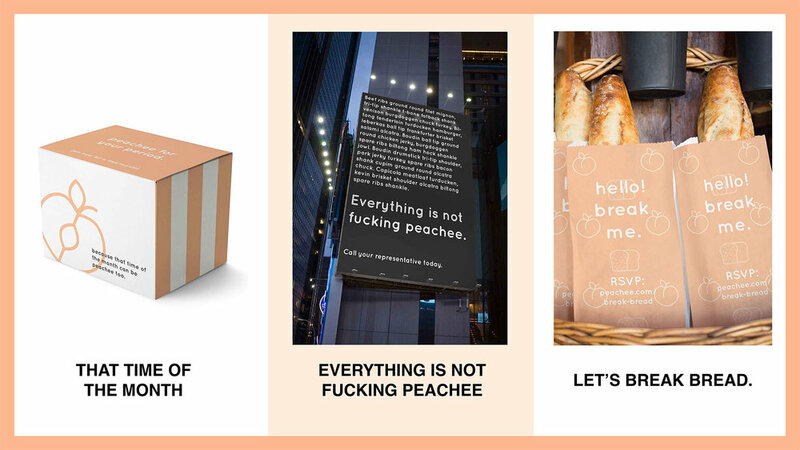 Two marketing campaigns were designed to promote political action and the use of Peachee. The first focused on displaying many overwhelming events side by side. The second took a more playful approach. In addition to creating a simple way to engage in politics, Peachee also has a built-in system with your roommates, encouraging young people to hold each other accountable and encourage action.